You’ve carefully acquired good measurement data, and now you want to access your data without worrying about communication headaches. Cellular communication sounds like a great option, but you've heard that trying to obtain a data plan for your cellular modem can be frustrating. You don’t want to deal with a cellular carrier who just wants to sell you a cell phone, and who is not very knowledgeable about providing you with a data plan to communicate with your data logger. Sounds reasonable, right? The good news is that Campbell Scientific is committed to providing cellular simplicity. As part of this effort, you can now subscribe to a cellular data plan directly from Campbell Scientific. You may have been frustrated with getting a static IP address so you can connect to your data logger from your computer. Static IP addresses tend to be expensive, hard to get, complicated, and risky in terms of hackers hitting the modem and running up overages on your cellular bill. Campbell Scientific cellular data service provides you a safe, secure, private dynamic IP address. If the address is dynamic, does that mean the data logger can only push data out? No. Campbell Scientific cellular-enabled devices come with a complimentary subscription to the Konect PakBus Router. The router creates a secure, fast, reliable connection between Campbell Scientific software and the data logger. You can connect to the data logger anytime to collect your data, check the status, or update the program. What about trying to get a cellular data subscription for a particular carrier or for use in a particular country? How easy is it for you to figure out if a data subscription plan will work for your needs? We can provide you with service on Verizon, AT&T, T-Mobile, and over 600 other carriers in 185 countries. Yes, we really have a global solution. Finding a data plan that provides enough coverage without the hassle of monthly bills can also be challenging. We offer several data plan sizes to fit your needs—from 25 MB per month to 5 GB per month. To make it even easier, these low-cost plans are billed annually; there is no need to worry about monthly cellular bills. In addition, you can log in to your account on the Campbell Scientific website to see your device status and current data use. The expansion and reliability of cellular connectivity make it a logical choice for data communications. Data costs keep coming down, and accessibility keeps getting better. Now you can order a cellular-enabled device and add it to a cellular data plan provided by Campbell Scientific. These devices are delivered to you activated and ready to use. 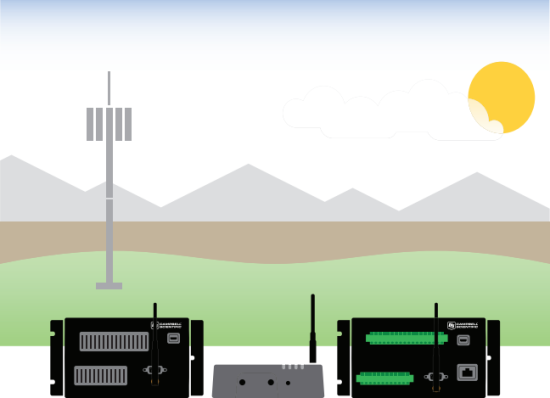 Our low-power modems make it easy for you to deploy your solar-powered data acquisition systems—wherever you need them. If you purchased a modem from Campbell Scientific in the past, you can get a cellular data plan from us today. This will help simplify your life by having all your data subscriptions managed by Campbell Scientific. Today, the CR300 and CR310 dataloggers can be purchased with an integrated cellular modem. In the future, you can expect us to provide more cellular-enabled devices that will work across the globe. Campbell Scientific is here to meet your complete system needs—from sensors and data loggers to communications devices and data analysis software. To help you, we are trying to address the challenges you may face, or may have already faced, with managing your cellular data plans. To learn more about our cellular data services, visit the Cellular Communications web page. To get all your Campbell Scientific cellular devices on one plan, contact your customer service representative. And order your next cellular-enabled device with Campbell Scientific Cellular Data Service. If you have any general questions or comments about cellular data service and communication with your data logger, post them below. Steven Moore is the Product Manager of Data Services for Campbell Scientific, Inc. He is passionate about and has spent most of his career applying technology to simplify complex tasks. Included in that work was managing the development of weather-responsive irrigation control equipment. Steve is excited to focus his efforts on expanding and improving the data service offerings of Campbell Scientific. Away from work he enjoys being a husband, father, grandfather, gardener, photographer, sailor, camper, and biker.